This past June, commercial fishermen captured an invasive Asian carp in the Chicago Area Waterways just a few miles away from Lake Michigan; the fish somehow evaded a series of electrical barriers that are meant to keep the invasive species out of the Great Lakes. Researchers and policymakers are now on high alert, as the carp pose a significant environmental and economic threat to the Great Lakes region. The term “Asian carp” actually encompasses four species: bighead, silver, black, and grass carp. All of these fish are known for being insatiable filter feeders, and have the potential to eat up to 40% of their body weight in a day. Their food of choice is plankton, which also turns out to be one of the main food sources for the region’s larval fish, native muscles, and other invertebrates. That means that if these all-you-can-eat diners make their way into the Great Lakes, it could spell disaster for much of the native aquatic life. For these reasons, the U.S. Army Corps of Engineers (CoE) has long been concerned about the coming carp invasion. The CoE operates three electrical barriers, which separate the Mississippi River basins from the Great Lakes; the main purpose of these barriers is to deter Asian carp and other nuisance fish by sending out electric currents in the water while still allowing for the passing of ships and other vessels. “I don’t think we can ever guarantee 100% of anything in life, but we think it’s well above 99% of the fish that are turned back,” said Army Corps of Engineers Project Manager Chuck Shea, who manages the barriers, in an interview with the Guardian. The fish that was found in June, which measured 28 inches and weighed eight pounds, has been sent to Southern Illinois University where an autopsy may reveal how it managed to get past the electrical barriers. There should be clues in the ear-bone formations that are characteristic of certain waterways, explained Josh Mogerman, deputy director of NRDC’s national media program, in an email. Discovering where the fish originated will likely give information regarding how it got past the barriers, which will be important in deciding how to best address the situation moving forward. “This has been a slow-motion disaster,” said Mogerman. It should be noted that there still isn’t evidence of a viable population of Asian carp existing beyond the barriers. Still, if fish continue to pass the barriers, the risk continues to grow; once established, carp are known are to spread like wildfire, with females laying “approximately half a million eggs each time they spawn,” according to the National Wildlife Federation. It isn’t just the native fish that are in danger; an invasion by Asian carp could have serious implications for economies that rely on the Great Lakes. According to the Asian Carp Regional Coordinating Committee, the Great Lakes provide about 1.5 million jobs and $62 billion annually to the region’s economy, with fishing, both commercial and sport, accounting for about $7 billion annually. And every year, about 65 million pounds of fish are harvested from the Great Lakes, according to The National Oceanic and Atmospheric Administration. So far there haven’t been any human deaths in the U.S., but carp infested waters don’t make for ideal swimming pools or boat outings. 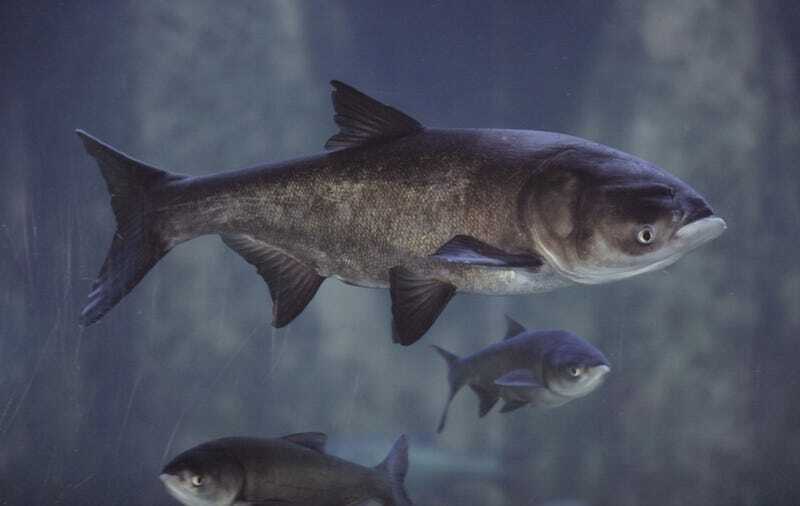 Asian carp were introduced to Southern States in the 1970s specifically because of their massive filter feeding appetites; they were placed in certain waterways to help deal with the runoff from fish farms and wastewater treatment facilities. However, “massive Mississippi River floods allowed the carp to escape and start making their slow advance northward,” explained Mogerman. Now Silver and Bighead carp are present in large areas of the Illinois and Missouri Rivers, where they continue their advance towards the Great Lakes. Even if these fish pass the barriers and establish populations, there’s still hope of stopping the invasion before the Great Lakes; there are a number of locks beyond the barriers that work to allow ships and vessels to pass through the waterways which could be closed off. “If Asian carp are found in an established population between the electric barrier and Lake Michigan, we would advocate for closure of some or all of these locks to block Asian carp from entering Lake Michigan,” explained Caddick. While such an action would help keep the economies that rely on the Great Lakes safe, it would have the opposite effect on other surrounding industries that rely on the canals for shipping materials. For example, Chicago’s heavy metals industry relies on these canals to bring in coal, gravel, and other heavy materials. For these reasons, closing the canals has proven difficult in the past. In 2009, former Michigan Attorney General Mike Cox filed a lawsuit to close the canals; the lawsuit argued that “any short-term economic impact or inconvenience from closing the locks pales in comparison to the devastation that will occur if Asian carp make their way into the Great Lakes in sufficient numbers to establish a reproducing population,” according to an article in Crain’s Chicago Business. But the lawsuit failed, as the state of Illinois, in partnership with industry groups, filed its own countersuit in 2010 against closing the canals. As the coming carp invasion creeps ever nearer, the CoE was charged with putting together a viability study for several locks and dams leading up to the Great Lakes, as well as investigating other means of keeping the fish out. The study should have been released for public review on February 28th of this year, but the Trump administration blocked its release, reportedly to allow time for the new head of the CoE to take office. But legislators from the Great Lakes region aren’t happy with this reasoning and want the study released immediately; in June a bipartisan group of Congressmen introduced legislation that would force the Trump administration to release the long-awaited study. “It’s incredibly irresponsible for the Trump Administration to continue to block the Army Corps from releasing a crucial plan to address the threat of Asian carp to our Great Lakes,” said Representative Debbie Stabenow, (D-MI) in an interview with The Detroit News. As of the publication of this article, the study has yet to be released.